The city Tbilisi offers a variety of parks in different districts of Tbilisi with patriotic characters, attractions and historical monuments. 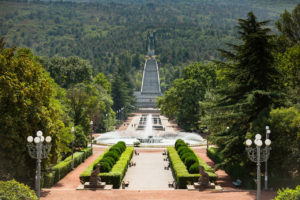 The Tbilisi Botanical Garden, the former Royal Garden, is located in the valley of Tsavkistsiklis (Leghvtkhevi) in the south of Sololaki Range. After Georgia’s annexation by Russia the garden became a state property. In 1845 it was named The Botanical Garden. In 1896-1904 the garden was expanded towards the west. In 1932-58 the former Muslim cemetery territory on the right bank of Tsavkisistskali and on the north-east slope of Tabori mountain was added to The Botanical Garden. Among the graves that survived there is a tomb of Azeri writer Mirza Fatali Akhundov (1812-1878). 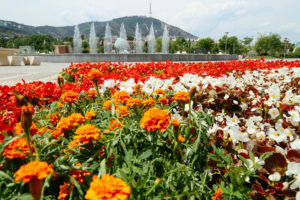 The Botanical Garden presents the rich collections of flora of various regions of Georgia and the world. There are several bridges on Tsavkistsavali within the garden. Among them is the arched bridge built on the top of the waterfall in 1914. There are also unique plant plots in Georgia and Caucasus, tropical oranges and plants in the Red Book. The area of ​​the Botanical Garden is 128,000 hectares. 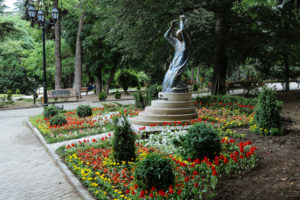 The main entrance of the garden is at the end of the botanical street, near Narikala. In the 1909-14 period, the tunnel was struck in Sololaki district and the second entrance was made through Asatiani street. Mushtaidi garden was built in the mid-1830s by Mir Fetagai Seid Tabrizi, who was a religious leader of Shi’ites in Azerbaijan in Iran. According to the statement, Mujahideh settled in Tbilisi because of a Georgian wife who had died early and was buried in the same garden. From 1853 the garden became a treasury property. There were systematically organized public sermons, exhibitions, performances. In 1935, the world’s first child railway was started. One of the attractions of the garden is the relic tree, the dolomite corom. 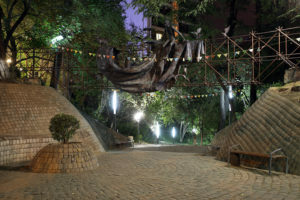 Mziuri – Children’s Town, Park of Rest and Culture in Tbilisi, situated in the river Vere Valley. At the end of the 1970s the Georgian writer’s Nodar Dumbadze’s article “Dreams haven’t killed a man” was published. In the article, the writer dreamed about building a children’s city in the Vere Valley. 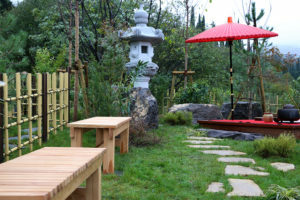 The whole group of architects worked on the project of the park. Park opened in 1982. It is arranged according to the plot of Nodar Dumbadze’s works. Alexander Pushkin’s Square, located on Freedom Square, is one of the most cozy and well-equipped squares in Tbilisi. It’s located on a small area and is buried in the heart of the city. The fountain water cascade located at its center is distinguished by the colorful lights at night, “which makes the square even more beautiful. Besides rest and relaxation, the wi-fi (wireless) Internet in the Pushkin Square will enable you to combine pleasure with usefulness. Now it is possible to seclude yourself in the quiet environment without leaving the city and at the same time do your work. Rike – one of the districts of Old Tbilisi on the left bank of the river Mtkvari, between Avlabari and Chugureti (now in Old Tbilisi district). In the late Middle Ages, the left bank of the Mtkvari River (formerly Avlabari Tunnel) was named Rike part of which was later taken by Chugureti. In the XVII century Rike was a competition area. There was a big road of Avchala (Later Rikis, Khetagurov, the Council Streets) that was traveling to Russia, when the river Mtkvari was rising Rike was flooded. In the nineteenth century, there was a market – Carvassla, workshops (masks, calendars, marshes, paints). In the 70s of the twentieth century, Rike’s old buildings were taken down to well-build the city. On November 23, 2011, a monument of Ronald Reagan was open in Rike Park, Georgia. Vake Park – Park located on a striped slope of the Trialeti Range. It is cultivated at the end of Vake district. Its construction began in 1946 and was allocated 200 hectares to create a green strip. The Vake Park and Chavchavadze Avenue from the North are connected by a wide staircase. The staircase is located on the main axis of the park, which covers the entire cascade of fountains. The park’s central axis ranges with a memorial to the Second World War. The central part of the park is separated by a fountain and a round pond. Red sand adds a certain allure to Vake Park, which is on all the pedestrian roads. Children’s town, open cinema, café-bars and a restaurant are located in Vake Park. At the south-west the park ends with the stadium of Mikheil Meskhi. Mtatsminda, Plateau, the end of the eastern strip of the Trialeti Range (within Tbilisi). Its height is 770 meters. It is constructed with upper-sand sandstone and clay. The name was adopted after one of the most important saints of the Christian religion – Mount Athos. According to the oral history the eastern slope of the mountain was made into a cave by one of the Assyrian fathers – David. In the IX century there was a church of Iveria Mother of God, in it’s place in 1542 brothers Nikoloz and David Gabashvili built Saint David’s monastery. The current church was built in 1871. There is also a small transfiguration church (built in 1809). The access road to the churches was built in 1817. From the beginning of the XIX century Mtatsminda was covered with a forest. The present forest is artificial. Culture and recreation park (formerly known as BB Stalin) is built on the Plateau, which is connected to the city by road and ropeway; There is a Funicular. Mtatsminda Pantheon of Georgian writers and public figures is on the eastern slope of Mtatsminda. On the mountain there is a TV mast. 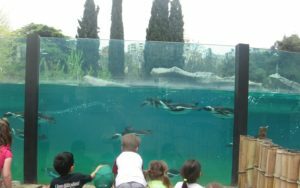 The Tbilisi Zoological Park was founded in 1927 by the Tbilisi City Council Decree. To set up the zoo Up to 70 (up to 120) ha of land was allocated to Vere Gorge. The following sections were considered: Caucasian or Lore, former USSR fauna, exotic, agricultural animals and others. Tbilisi National Park – National Park in Georgia. It is located in the territory of Mtskheta-Mtianeti and partly in Tbilisi and Kvemo Kartli. It is the first national park in Georgia, created in 1973. After some time, it lost the status of the National Park and was created again in 2007 on the area of the former National Park and Saguramo Nature Reserve. The Tbilisi National Park is located on the Saguramo-Yalono basins of the southern slopes of the Caucasus Range and their branches, which are stretched across the river Mtkvari To the river York at 600-100 m above sea level. Its area is 23 218,28 ha. It consists of Saguramo, Gldani, Martkopi, Gululebi and Gardabani districts. 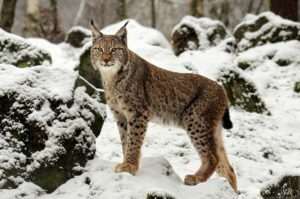 The park is rich in fauna, including rare species such as Caucasian noble deer and lynx. The highest point is 1385 meters above sea level. It is noteworthy that the Tbilisi National Park is the protected area situated closest to Tbilisi. Boris Paichadze Dinamo Arena, also Dinamo Arena, the main and largest stadium in Georgia. The stadium is the home of Dinamo Tbilisi. The original structure, known as the central stadium, was built in 1932-1935 (architect Archil Kurdiani). In 1955-1956 there was a small reconstruction and in the 1970s the old building was demolished and a larger, today’s stadium, was built, which ceremonially opened on September 26, 1976 (Architect Gia Kurdiani; Constructor Shalva Gazashvili). At the time of its construction this stadium was the third in capacity in the Soviet Union. 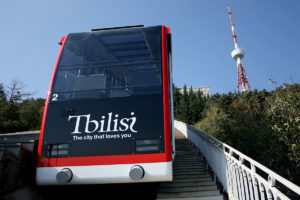 It was built to increase the popularity of Tbilisi Dynamo and the team’s success. The stadium was able seat 78,000 spectators and responded to all requirements of the Soviet Football Federation. In 1995, the stadium was named after Georgian footballer Boris Paichadze. 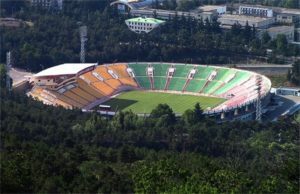 In 2006, the stadium was repaired and the seats were also replaced by the UEFA new requirements, which resulted in reduced capacity of up to 55,000 people. Most of the second part is roofed. On 25 August 2011, the national stadium was awarded with the right to use “Dynamo” for 49 years. 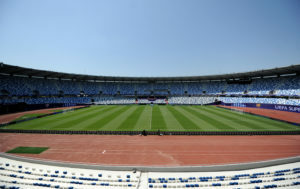 The 2015 Boris Paichadze National Stadium was hosting the UEFA Super Cup match. Mikheil Meskhi Stadium – Former “Locomotive” stadium, was constructed in 1952 by Yuri Kasradze’s project in the vicinity of Vake Park with 26 thousand capacity. In 1960, Arena was reconstructed (architects – Temur Abashidze, Anri Kurashvili) and 10 400 places were added. Since September 2011 Mikheil Meskhi stadium is national championship and Davit Kipiani Cup matches, football club Tskhinvali “Spartak” home arena. Tbilisi Reservoir, “Tbilisi Sea”, Samgori reservoir, is water reservoir in eastern Georgia, on the Iori River, North-east of Tbilisi. 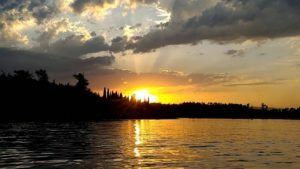 It was created in the place of lakes – Avlabari, Ilgunian and Kukia. It extends from north-west to south-east. Operated since 1953. In the north-west part it is wide, the south-east part is narrow. The length – 8,75 km, the largest width is 1,85 km. Area 11,6 km 2. Water volume of 308 million M³. The greatest depth of 45 m. Average depth of 26,6 m. The reservoir level rises in the spring, in summer and autumn it decreases by 7-10m due to intensive use of irrigation water. Turtle Lake, Korki Lake – Lake in Tbilisi, on the northern slope of Mtatsminda ridge, at 686.7 m above sea level. Surface area 0,034 km2, basin area 0,4 km2, depth depth 2.6 m, average depth 1,7 m. The length of the lake is 180 m and the width is 50 m. It is placed in a small hallow. It is created by esoteric (mainly rocky landslides). The water of Varaziskhevi is thrown into the lake. In addition turtle lake is fed by rain and underground waters. Fish is poor. Turtle Lake and its surroundings are well-arranged. Sport events are often held. The funicular railway is brought to the lake. 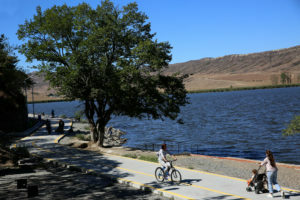 Lisi Lake – Lake in the Tbilisi Quail, north-west of the city. Water mirror area 0,47 km2, basin area 16 km 2, maximum depth 4 m, volume 1,22 mln. M3. It is nourished with rain, snow and underground water. It has high levels in spring, low – in fall. In summer the water is warm, with the maximum temperature 28 ° C. In winter the ice is found on the lake, sometimes icebergs. The water is salty (mineralized 2695 mg / l). The fish is grown in the lake. 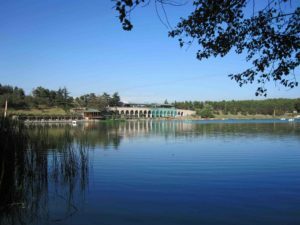 Lisi lake is a recreation area for lovers of sport and fishing as well as for Tbilisi residents.